Those in search of some fresh air can go for a stroll through the Rondenbos domain, a charming little park surrounding the Bosquet Castle, which houses the town hall of Beersel. The Bosquet castle, a prime example of eclectic architecture, has a chequered history. 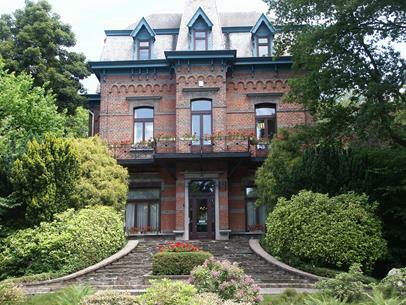 The original building and adjacent park were built in 1903 by Mr Bosquet, an Antwerp timber merchant. After World War I, the coachmans house in the front was added to the domain. During the thirties, the property changed hands several times, before being requisitioned by the occupying German army during World War II. After the war, the domain served as a meeting place for the KAJ, the Young Christian Workers youth movement. In the early seventies the municipal authorities of Alsemberg moved to the domain and after the merger in 1977, the Rondenbos domain continued to serve as a town hall. Both the castle and the park underwent major renovations and improvements in the nineties.